SCARF Acne (here). BAG Balenciaga Le Dix (here). BATH OIL Ortiga ‘Zagara’. GOLD EARRING Line & Jo. MIRROR Gubi ‘Adnet’ (here).LEATHER CHAIR artilleriet.se. PERFUME Byredo ‘Pulp‘. PEARL EAR CUFF Sophie Bille Brahe (here). STAR EAR CUFF Saskia Diez. CROSS HOOP Stone. VASE ‘Flask’ from Svenskt Tenn. TRAVEL PERFUME CASE Byredo (here). SERUM Chanel ‘Le Weekend‘. POSTER Society 6. This entry was posted in Shopping and tagged birthday, line & jo, ortigia, Saskia Diez, Sophie Bille Brahe, stone, wishlist by Carolina Engman. Bookmark the permalink. That chair is so cool! What a nice wish list! In love with that bag, nice wishlist. The Balenciaga bag is perfect! Hell, all Balenciaga bags are perfect. aaah lovely items ;)) have a wonderful birthday!! Great selection! I love the chair! Love the items! And happy almost birthday! That bag is to die for… wish i could afford it!!! Thanks for sharing these great picks! I was going to say which things I liked… But it turns out I like everything. That chair is everything!! This chair is sooooo unique and chic! And the little dainty jewelry are must haves!! The balenciaga bag is so beautiful! Check out my latest posts onVenoma’s fashion diary and feel free to enter my Rosewholesale 30$ gift card giveaway ! 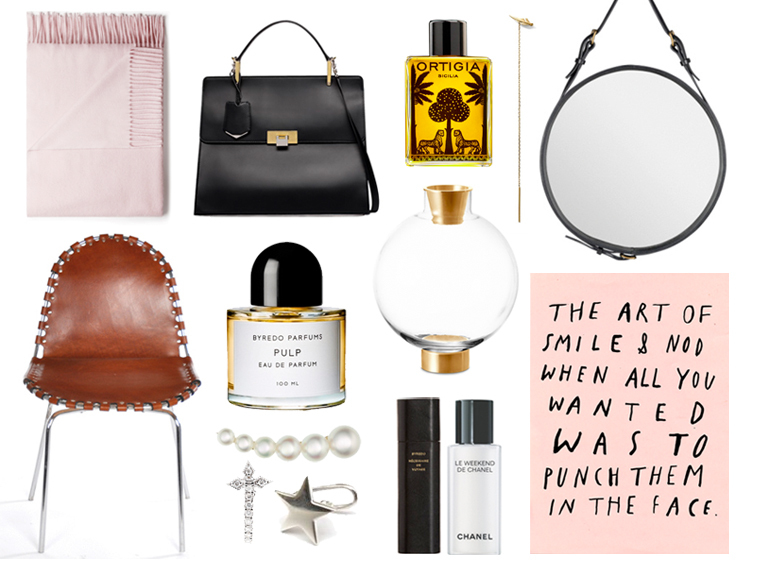 Beautiful wish list, thats a gorgeous bag! Love your wishlist, especially the bag and chair :-) The pic is pretty funny too (isn’t that so true)! Happy birthday!!! The Balenciaga bag is amazing! Love it! love that bag and scarf! great wishlist! Very much want that Acne scarf. Love the color. God that chair is killing!!! Great list! Happy Birthday! I love that poster. I need it. I love the star earings; an use everyday! PERFECT Selection! Couldn’t find the poster on the website – would you have name or nr perhaps?